The final part of this series covers 9 notable firms in the HK tailor industry – James S. Lee which was once the largest custom tailoring concern in HK; Tung Sun, Tung Hing, British Textiles and Maiwo Yang, four major Shanghainese tailors in Central in the 1950s and 60s; Tom Brothers and James Lau – two HK tailors whose names appeared in the US newspapers and Smiley Chow, a globe-trotting entrepreneur. Last but not least is Kwun Kee Tailors, probably the best-known tailor brand to the general public in HK as it targeted the local mass market with TV sponsorships and currently has over 100 stores all across China. James S. Lee & Co was recognized by the New York Times in 1956 as the largest custom tailoring concern in Hong Kong. The Lee tailoring empire traced back to the tailor ship established in 1919 by James S. Lee’s father Lee Ping-san (李聘三) in their hometown of Cheefoo (now known as Yantai) in Shandong province, selling black serge suits and inexpensive hats to American missionaries and also making suits and uniforms for US Navy and Marine personnel. Born in 1917, James Smith Lee had multiple Chinese names – Lee Wei-ting (李維鼎, which he used in HK), Lee Yu-chiu (李禹九, which he used in Taiwan) and Lee Jee-san (李稚三, which means Lee Ping-san Jr and possibly his original name). He was educated in Shanghai at a Catholic High School and the School of Commerce at the University of Shanghai. In 1945, he and his father moved their operation to Tsingtao before moving yet again in 1948 to HK as the Communists advanced. Having served the US military for over three decades, the Lees were quick to capture the business opportunities associated with the escalation of US military effort in the Far East after WWII and very quickly established branches in Tokyo and Seoul to sell custom suits and uniforms to the large number of American soldiers being deployed there. Within a few years, the Lees had built up a large operation in HK which included a factory under the name of James S. Lee Clothing Mill (發利服裝製造廠) with 450 workers that churns out 300-500 custom made suits per week and 3 retail shops (225-227 Gloucester Rd and 8 and 29A Cameron Road) in HK. By 1956, his business was doing US$1.5 million in sales, half custom made and half ready made with 40% of business from Americans, 40% from Europeans and remaining 20% from locals and Southeast Asia. Lee also had a buying office in British textile capital of Bradford to procure British wool, with US$400,000 in inventory which he was selling to other tailors in HK in addition to his own operations and was buying US$200,000 worth of fabric from 2 leading American textile concerns. In March 1956, James S. Lee made his first trip to the US where he visited the NYC headquarters of the Custom Tailors and Designers Association of America and became their official representative in HK. In June of the same year, Governor Grantham (who was a fan of the firm and referred the visiting Ethiopian Emperor to shop there later that year) visited the James S. Lee factory and sadly at the cocktail reception, his father Ping-san suffered a brain hemorrhage and died at the age of 73. In 1959, James S. Lee became a director of the Tung Wah Group of Hospitals. He was also honorary chairman of the Shantung & Hopei Clan Association and director of the Chinese Manufacturers Association. In 1961, the James S. Lee Mansion at 33-35 Carnavon Road in TST was completed, not far from Haiphong Mansion at 101 Nathan Road where the flagship store of the firm was located and the Tsimshatsui Kaifong Association appointed Lee as an adviser. In 1968, another branch was opened in 51 Gloucester Road in Wanchai. By that time, James S. Lee also had offices in Okinawa, Saigon, Bangkok, Taiwan and New York in addition to HK, Japan and Korea. In 1969, the group celebrated its 50th anniversary at the Peninsula Hotel – at the time the group had 94 subsidiaries and employed over 2000 employees with plans to build a 14-story factory building. In the 1970s, the Lees turned their attention away from tailoring to investments. During the stock market bubble in 1973, Lee injected some of his properties in HK into Oxford Properties & Finance (晉利地產金融) and listed the company on the Stock Exchange. The next year, he acquired via Oxford a 40 million sq ft plot of land (the size of the Kai Tak Airport) in Guam for HK$40 mil, making him one of the largest landowners on the Pacific island with strong US military presence. Allegedly it was a high-ranking US military official who was a tailoring client who sold Lee on the potential of Guam and in addition to real estate he also became involved with the Coca Cola bottling operation in Guam in the 1970s although that partnership ultimately ended with a decade long dispute with the soft drink giant. In 1975, he was a founding director of the United World Chinese Commercial Bank (世華聯合商業銀行, now Cathay United Bank) in Taiwan, where he also invested in manufacturing concerns in Kaohsiung. In 1984, he stepped down as chairman of Oxford in favor of his youngest son William Teh-yee Lee (李德義, not to be confused with another property developer Samuel Tak Lee who has the exact same Chinese name) but remained firmly in control. In 2001, the 83 years old James S. Lee (who was spending most of his time in Japan to tend to his substantial property holdings there although he was diabetic and had also suffered from heart condition) was found to be in breach of the minimum public float requirement as he secretly controlled 90% of Oxford’s issued capital through 11 entities under his different aliases and the firm was finally privatized in 2004. Left: Business card of Tung Sun with warning about taxi drivers taking clients to the wrong tailors with similar sounding names because of commissions; Right: Tung Sun shop on the left at 48 QRC, A Man Hing Cheong can be seen next door. Tung Sun & Co was one of the leading tailors in the 1950s and 1960s, operating out of 48 Queen’s Road Central right next to A Man Hing Cheong. It was one of the few official US government contractors and proudly displayed that fact in their store signs and promotional materials. Its proprietor was Wong Yu-fong (王汝芳), who visited Europe every year to procure materials based on old newspaper articles. Any additional info about Wong and Tung Sun is much appreciated. Tung Hing was a major tailor in HK with its flagship store located at 62 Queen’s Road Central (current sire of Peter Building which was built in 1968) right next to China Emporium, one of the big four Chinese department stores at the time (other three being Wing On, Sincere and The Sun) Its owner King Yan-mei (金仁美) came from Shanghai and its name first appeared in the Directory of China in 1938. In 1961, a fire took place at its branch on 655 Nathan Road which resulted in tens of thousands of dollars in damages. Similar to Tung Sun, any additional info anyone could provide on Tung Hing is much appreciated. In the history of the HK tailoring industry, there are two firms with very similar names and logos – British Textiles which was founded in 1954 but went out of business in the mid-1960s and British Textile which was founded in 1964 and still exist today. The first firm – British Textiles Company was a leading tailor and distributor of European fabric in the late 1950s and early 1960s and was owned by a Shanghainese businessman by the name of Lee Wen-yuen (李文源). The firm first operated out of Great China House at 8 Queen’s Road Central and later moved to Asiatic Building (now Central Tower) at 26 Queen’s Road Central. It was very aggressive in terms of promotions – lots of advertising and discount sales, recruiting many movie stars to participate in charity sales and also touted itself as the “largest in the Far East”. In 1955, Lee formed an import/export firm Mercantile Agencies Ltd (茂泰股份有限公司) with $200,000 in registered capital and counted Francis Tien Yuan-hao, the founder of Manhattan Garments and father of politicians James and Michael Tien as a shareholder. What helped to fuel the firm’s growth was Canton Trust and Commercial Bank, the aggressive bank controlled by Chinese American merchants which was opening lots of branches and lending aggressively to different types of businesses and property developers. In September 1962, when British Textiles celebrated its 8th anniversary and store expansion, the guests of honor were Sir Tsun-Nin Chau, the chairman of Canton Trust and other senior executives of the Bank. When the Canton Trust collapsed during the banking crisis of 1965, British Textiles was affected and went out of business. In 1966, a new Shanghainese tailor shop by the English name of British Textile Company (without “s” at the end) and very similar Chinese name and BTC logo opened at the Pacific House at 30B Queen’s Road Central. 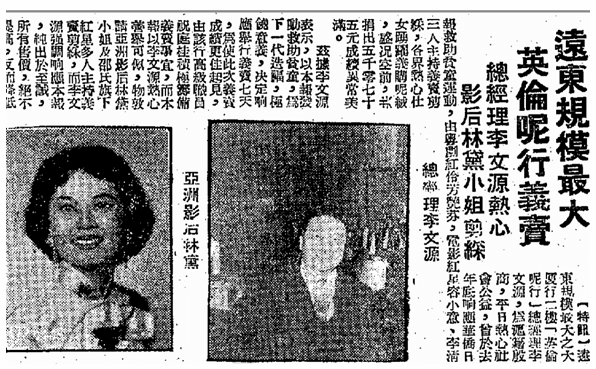 In the opening ad – one of the senior staff of the original “British Textiles” – Chuk Ting-kwai (祝庭桂, in charge of the women’s department) was listed as a shareholder alongside Cheung Hung-cheung (張鴻昌) and two other partners. According to the firm’s website, it was founded 2 years earlier in 1964 in a hotel room at the American Hotel (later the HK Hilton). Cheung Hung-cheung was the chairman of the new BTC and in 1978, he received an award from Princess Alexandra in Australia for his success as a distributor of Australian wool in HK. In 1982, his son Richard Cheung (張松立) joined the business after graduation from Northwestern University. In 1992, the firm relocated to New Henry House after 26 years and in 2001 moved to its current location at the Galleria (next to 2 other prominent Shanghainese tailors – H. Baromon and Ying Tai). Adjacent to British Textiles on QRC at 8A Queen’s Road Central was Maiwo, Yang & Co, another leading Shanghainese tailor and fabric distributor. Founded in 1947 by Maiwo Sze (史美和), a prominent Shanghainese fabric merchant who founded the import export firm Mai Fung & Co (美豐洋行 ) in Shanghai in 1933 before coming to HK in the late 1940s. In 1960, Maiwo Sze embarked on a round the world trip to source fabric and survey the tailoring industry. The same year, Judith Friedberg described Maiwo Yang as “a huge fabric house with good tailoring at going, moderate prices” in her Shopping Around the East and Near East. In 1965, a branch was opened in Prince’s Building. In 1974, it was located on the ground floor of Caxton House on Duddell Street. In 1980, the firm relocated to Man Yee Building. Many firms in the HK tailor industry had prospered from selling suits to US soldiers visiting HK during the Vietnam War but one firm by the name of Tom Brothers & Co Ltd had the unfortunate record of being named in the US congressional hearings in 1970-71 regarding fraud and corruption in the management of military club systems in Vietnam. The firm was controlled by the Tung brothers (Jimmy, David and Henry Tung), and two of the brothers (David and Henry) were named co-conspirators in the corruption case but not charged. According to company registry records, Tom Brothers & Co Ltd was incorporated in 1964 and dissolved in 1995. The first HK tailor to set up shop in New York was not Ascot Chang (which happened in 1986) nor was it Mohan’s (which happened in 1963). 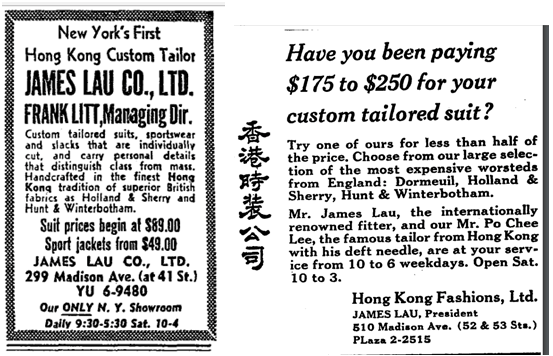 Instead, it was a relatively obscure tailor (although in his ads he refer to himself as “internationally renowned fitter”) by the name of James Lau, whose company was listed as James Lau Co, Ltd or Hong Kong Fashions, Ltd. From 1961 to 1970, his ads ran frequently in the New York Times with his name listed together with a local salesman by the name of Frank Litt and a tailor by the name of Po Chee Lee. His New York showroom was located on Madison Avenue and even the New Yorker wrote about his business. According to details from a US customs court report in 1971, James Lau resided in HK and sent the orders he received in New York to Wang Fat Tailor for fulfilment. In the 1950s-70s, a globetrotting Shanghainese businessman by the name of Smiley H. Chow (周厚村) was busy doing two things across the globe – selling HK custom made tailor suits and promoting the KMT regime in Taiwan. A native of Fenghua, the hometown of Chiang Kai-shek and many Red Gang tailors, Smiley had a special connection to Chiang as his uncle was one of Chiang’s sworn brothers. His older cousin Chow Tien-hsiang (周天翔) was the founding general manager of the Taiwan Television Enterprise, one of the big 3 TV stations in Taiwan from 1962-75. Grew up in Shanghai, Smiley moved to Japan in the late 1940s where he began selling HK custom made suits to US servicemen. (In Tokyo there is Smiley Tailor and Smiley Building in Roppongi – likely started by Chow) Outside of business, he was active in the local community and was elected the third chairman of the Kiangsu Chekiang Association of Japan in 1955 and served as director of the Tokyo Chinese School. In 1956, he led a delegation of 30 Chinese Japanese to Taiwan to celebrate the birthday of Chiang Kai Shek and participate in the Chiang Kai Shek Cup basketball tournament. In 1957, Smiley Chow went on a round the world tour visiting 20 countries (except for Australia) in an effort to unite the 10 million Chinese overseas to support the KMT regime in Taiwan. The same year, he decided to move his primary residence from Japan to Italy and established Compagnia Smiley Italiano, S.A.. in Rome. In Europe, Smiley continued his business of selling suits to US military personnel. According to the biography of Chuck Feeney, the philanthropic co-founder of Duty Free Shoppers (DFS), it was in Rhodes, Greece in 1958 where DFS co-founder Bob Miller ran into Smiley Chow who had a huge bundle of US dollar bills sewn into his shorts and Chow suggested Miller to move to Hong Kong. 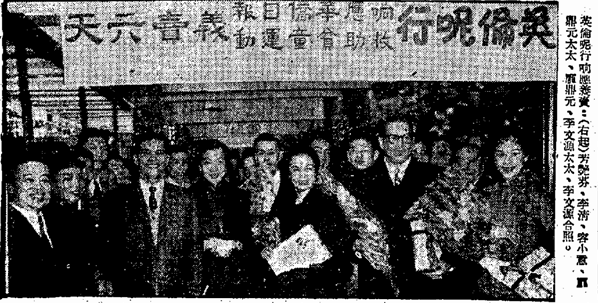 In 1960, Chow led a delegation of Italian Chinese to Taiwan to celebrate the inauguration of Chiang Kai-shek and Chen Cheng as president and vice president. In 1962, Chow was elected first chairman of the Southern Europe Chinese Chamber of Commerce. He and his wife May C. Chow (張梅菊) established a number of companies across the globe (including the US where they owned real estate in Virginia Beach) under the “Smiley” name. The archive of Admiral Elmo Zumwalt, who was commander of naval operations in Vietnam, contains letters and cards to and from Smiley and May Chow in 1974 and 1975. While most of the other tailor shops covered in this series catered to the higher end or export mail order markets, Kwun Kee have achieved tremendous success serving the tailoring needs of the local mass market, with the largest number of retail outlets in HK at one point. Kwun Kee began as a small tailor shop in the industrial district of Kwun Tong (hence Kwun in its name) in 1962 with a staff of 5. The firm’s founder Yuen Yeung (阮揚) started out as an apprentice and operated a workshop doing work for other tailor shops before starting Kwun Kee. 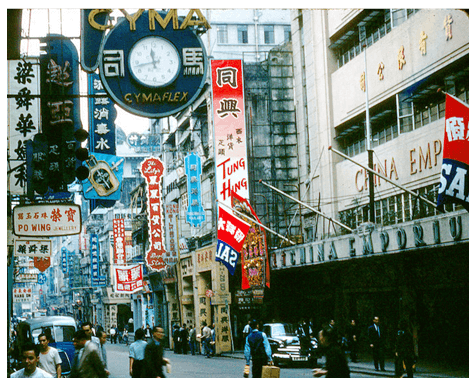 After the 1967 riots, the economy quickly recovered and another shop was added in Kwun Tong. In the mid-1970s, the founder’s son Yuen Chi-kwong (阮志光) joined the firm and a period of rapid expansion began. In 1977, Kwun Kee opened its first shop in the busy shopping district of Mongkok, putting the shop on the radar of HK consumers. To help promote the brand, Kwun Kee has sponsored the suits for many TV shows since the 1980s. Between the late 1970s and early 1990s, the firm added 3-4 outlet per year and at its peak in the early 1990s had close to 100 shops all over Hong Kong. To support this growth and ensure quality, production was gradually moved to a centralized site in Kwai Chung and in 1990, Kwun Kee acquired its own 12 storey industrial building on Wai Yip Street in Kwun Tong. The manufacturing arm of Kwun Kee is known as HK Chekiang Garment Factory Ltd (港浙製衣廠, the Chekiang in the name suggest that the low-key Yuens might be Shanghainese) which was incorporated in 1981. As mainland China opened up in the 1980s, Kwun Kee established a joint venture factory in nearby Dongguan and also opened its first store in the mainland in the Nam Fong Building in Guangzhou in 1991. Kwun Kee found success in the mainland market as the demand for Western suits soared while the local market became more difficult with low cost suits from Shenzhen and soaring rents in Hong Kong. Today, Kwun Kee only maintains 5 stores in HK while it has over 100 shops all over China in cities ranging from Beijing to Urumqi. This article was first posted on 27th October 2017.